CV Instruments hardness reference blocks are used for annual verification and calibration of hardness testing machines, as well as for periodical check and sometimes for overtaking of hardness scales on a hardness testing machine. That"™s why hardness reference blocks are a necessary help of industrial Quality Management. Only the use of high quality, precise hardness reference blocks calibrated to applicable standards can ensure the functionality and relative reliability and accuracy of measurement of a hardness testing machine. The hardness reference blocks used for indirect verification should conform largely to the workpiece to be tested, in terms of material characteristics and hardness range. For this reason a hardness reference block made of aluminium was developed for the lower hardness range which can not be covered by steel, using new materials technology methods. When using hardness reference blocks it is irrelevant wether the value of the nominal hardness to be delivered corresponds exactly to the actual calibration value observed, since scale adaptation should be carried out with at least two hardness values. A hardness reference block shall only be used as according to the standards to that method and test condition for which it was calibrated. 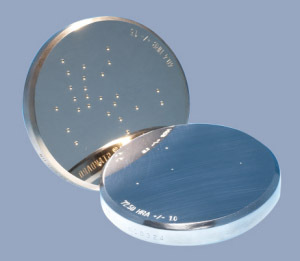 CV Instruments certified hardness reference blocks are available as folllows and all conform to the international standards as mentioned above. CV Instruments certified hardness reference blocks are available as follows and all conform to the international standards as mentioned above. Order your blocks based on nominal values. Please ask for our separate product list of nominal hardness values available per hardness scale and type of certificate. These CV Instruments reference blocks are available with DKD/MPA certificate only. They are available in lower nominal values in Rockwell, Brinell and Vickers scales. Ask for our separate sales list.